We know that when it comes to your business, you know it best. 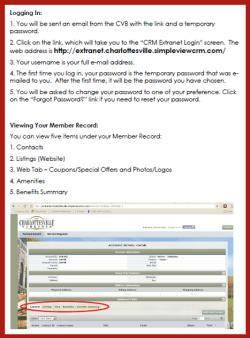 That&apos;s why the most highly qualified person to update your listing on visitcharlottesville.org is you! Adding and editing information about your business is done through what we call "the partner extranet" and its easy to do! Since the hospitality and tourism business operates 24/7/365, the extranet allows you to login and update, edit, add or delete information relevant to your business at your convenience at any time. Our webmaster (webmaster@visitcharlottesville.org) is eager to help, but only works 8-5pm Monday-Friday, so please use this page for any after-hours guidance. Since everybody learns differently, we put together different ways to help learn the same principles: how to update your listing and navigate the partner extranet of www.visitcharlottesville.org. To login to the the extranet and update your business, you&apos;re going to need a username and password. Your username is your email address. Some of you may already be in our system and have a password. If not, you&apos;ll need to request a password by filling out the Help form. Once we&apos;ve got your username and password all set up, please use the below materials to guide you through the updating process. We&apos;re looking forward to seeing your listing online! Click here to log in to the partner extranet.